The sister and I went to a Japanese curry restaurant before heading down to San Luis Obispo for the weekend. Yep… that’s TWO trips for me this week! I literally returned from Portland two days ago, and only had one day to unpack and repack! I ordered a dish that came with a choice between corn potage, miso soup, and salad. The waiter suggested the popular choice, the corn potage. I thank the waiter for the suggestion! Miso soup and salad also sounded boring compared to the corn potage! The best way to describe corn potage is creamed corn, thickened with cornstarch, with bits of corn kernels. It’s full of creamy corn goodness. If you’re not a fan of corn, go with the miso soup or salad. If you’ve ever lived in Japan, you’ve probably had Corn Potage. It probably came to you in a super-convenient form, like from a vending machine, instant soup packet or with your Mos Burger meal. Corn Potage is French. Just like cream puffs and crepes, Japan adopted it, adapted it, pronounce it something like: “konpotaaj” and serve it in a cup or mug. It always has the same creamy corn taste.. The word “potage” is an old French term for thick stew (potted dish, literally); as for how potage mades its way to Japan, well… I came up empty in my cursory research. 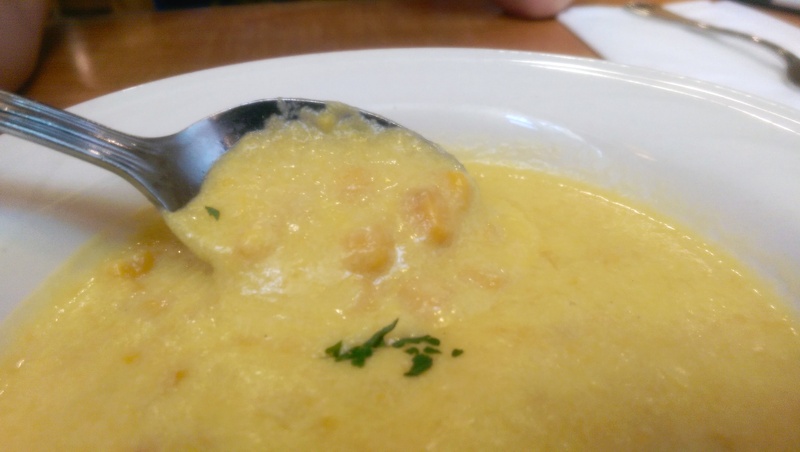 Musings aside, corn potage has become a very popular Western-style food in Japan–but maintains its French origins in its preparation by building its flavor from a basic roux of butter and flour. Blending the corn into the broth creates the mushy consistency that normally takes hours for traditional potage soups, making for a soup that is hearty but altogether different than corn chowder.